Do your beloved furry ones leave behind odors that aren’t so delightful? If so, we figured out a Simple Pet Odor Removal Tip! Our sweet dogs, Levi and Leia, actually have their own little doggie room that is a size of a storage closet. We put their beds in there and they stay in their domain during the day when we are not home. I love being able to spray Febreze Air Heavy Pet Odor Eliminator when I let them out of their room when I get home from school. It smells so fresh that I have a habit of spraying it on our stairway, too. 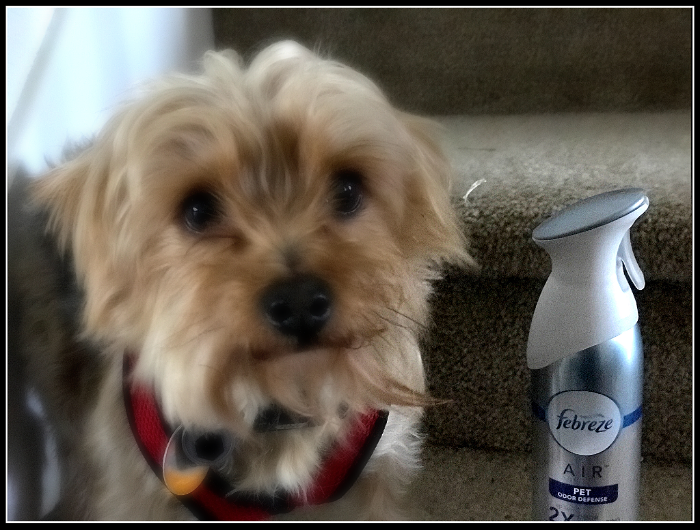 You might become addicted to Fabric Refresher Pet Odor Eliminator and Febreze AIR Heavy Duty Pet Odor Eliminator . It is only suggested that you spray fabrics weekly to keep them fresh (but I won’t tell on you if you spray every day). Our couch and chairs in our living room are covered with fabric, and, of course, our dogs’ favorite place is snooze is on top of the pillows while we are downstairs. Honestly, the smell of dogs isn’t such an offensive odor to our family, but I like to spray Fabric Refresher Pet Odor Eliminator on the pillows and chairs before we have guests over just in case they don’t adore our family furry friends as much as we do. It leaves such a clean, crisp fragrance in our living room. Swiffer products, such as, the Swiffer® Sweeper X-Large™ Starter Kit and Swiffer® WetJet™ Mop Starter Kit are the go-to cleaning products that I use on my floors…and they have Wet and Dry Pet Refills!. It takes little time and effort for a magnificent clean laminate floor. This simply allows for more quality time with your furry friends. 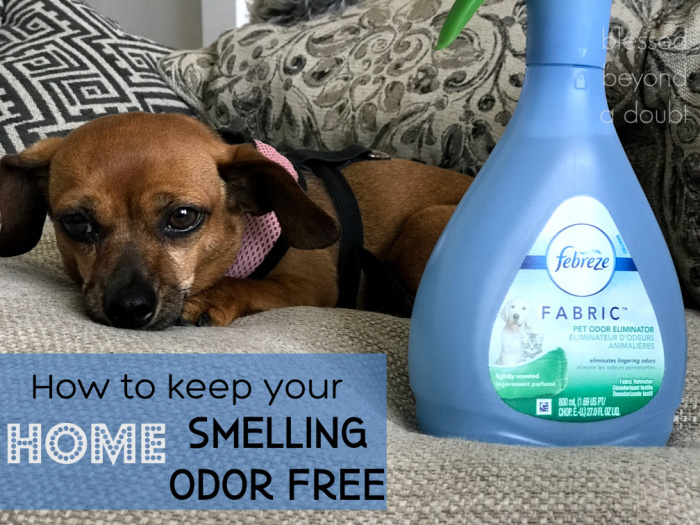 There are so many other uses for Febreze FABRIC Pet Odor Eliminator, such as hard-to-wash fabrics throughout your home, like carpets, furniture, upholstery, bedding, toys, gym bags, and much more. Oh, don’t forget your children’s backpack. Don’t worry! Febreze products are totally safe to use around your pets and children. The Swiffer and Febreze product lines are available at your local grocery, pet, home improvement and mass merchandise stores including Petco. 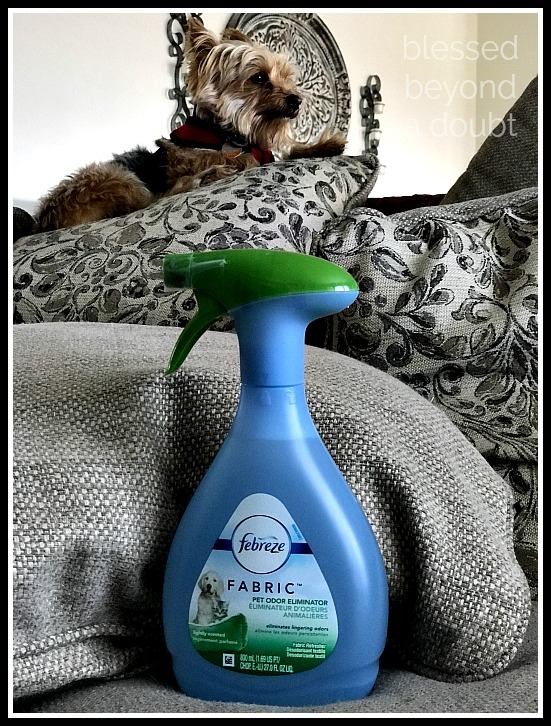 Since Febreze is truly one of my favorite products to tackle pet odor removal, we are giving away (1) Febreze FABRIC Pet Odor Eliminator and (1) Febreze AIR Heavy Duty Pet Odor Eliminator to one of Blessed Beyond a Doubt readers. Simply pin this post to Pinterest and leave the url to the pin in the comment section. Please don’t forget to leave your email so we know where to find you. I will be picking a random winner on February 17th at 11:59pm. All entries will be verified. So don’t let the winter weather woes creep up on you this winter season, run by the store and grab the best pet odor eliminator today.